It can also be prepared ahead of time and frozen for up to an entire month before baking and serving. Super convenient and super tasty, too! Our sweet hostesses this week are Hilary of Manchego’s Kitchen and Liz of That Skinny Chick Can Bake. 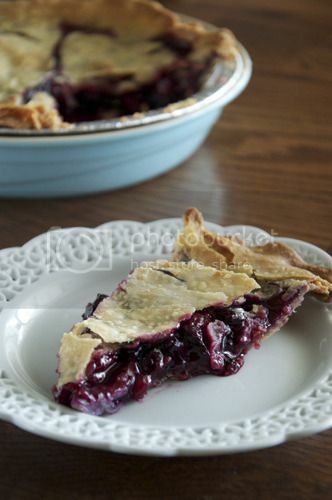 They’ll both have the recipe listed on their blogs, if you’d like to recreate this yummy pie. And for a list of participating bakers, click over to the ‘Leave-Your-Link’ post on the Tuesdays With Dorie homepage! Even if you don´t remember the pics speak for themselves. Awesome pie! 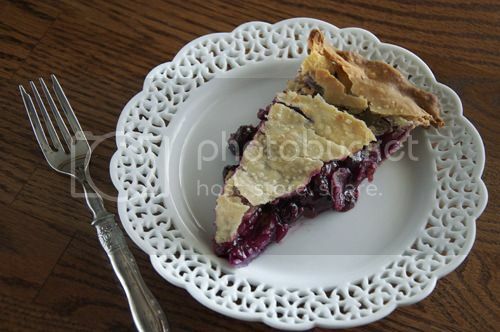 Jesica, one delicious looking Blueberry-Nectarine Pie with a perfect crust and a delectable looking filling! Terrific! I also love your cakes plates, they are very pretty! Jessica, A perfect looking pie with lovely photos!! I guess you don’t have to remember anything else except how delicious it was…that says it all! Your pie crust looks very flaky and oh so delicious. Great photos! It looks perfect and the fact that you don’t remember anything but that it was good, means the recipe is a keeper. Kudos for making this early! It looks fabulous! Looks so classy on a fancy plate! It looks perfect! So flaky and beautiful! that is a perfect looking pie! I love your pictures and the wonderful dish. Yes, we all seemed to love this one. Yours looks delicious. Yes, we all seemed to love this one. When I made mine I also thot it would have been a great 4th of July pie. Previous post: Meet Your Newest ‘K-Cup Ambassador’!